(PAT)>> WELL IT LOOKS LIKE YOU'VE GOT EVERYTHING READY. 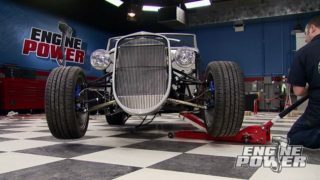 (PAT)>> WELCOME TO ANOTHER AWESOME EDITION OF ENGINE POWER. 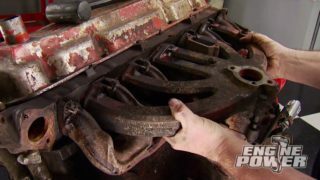 TODAY WE'RE GONNA BE BUILDING A 455 BUICK, AN ENGINE THAT DOES NOT GET THE ATTENTION IT DESERVES. 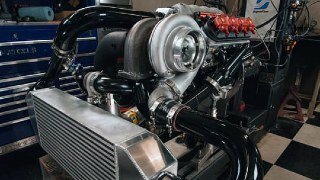 NOW BEFORE FEDERAL REGULATIONS TO REDUCE EXHAUST EMISSIONS WENT INTO EFFECT IN 1971, THE BASE 455 WAS RATED AT 350 HORSEPOWER AND A MIND BLOWING 510 POUND FEET OF TORQUE AT 2,800 RPM. 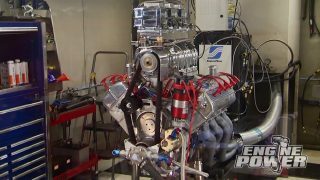 WELL THIS ENGINE IS GONNA CRUSH THOSE NUMBERS, AND WE HAVE ONE OF THE BEST BUICK ENGINE BUILDING GURUS IN THE BUSINESS HERE TO HELP US OUT. ROB CHILENSKI OWNS STAGE ONE AUTOMOTIVE IN POMPTON PLAINS, NEW JERSEY, BUILDING FULL RACE CARS AND HIGH PERFORMANCE ENGINES. (ROB)>> IT STARTED OFF AS A BUSINESS BUT THEN IT BECAME A GATHERING SPOT BECAUSE AS I GREW I STARTED TO TAKE CUSTOMERS AND MAKE THEM FRIENDS AND ACQUAINTANCES. (PAT)>> HE QUICKLY SHOWED HIS TALENTS CREATING WICKED HORSEPOWER OF ALL MAKES, BUT IT'S HIS LOVE FOR HIS BUICK THAT HAS BROUGHT HIM HERE. (ROB)>> BUICK DOESN'T COMPARE TO OTHER ENGINES IN THE WAY OF HAVING A GREAT PERFORMANCE BACKGROUND. SO IF YOU COULD TAKE A BUICK AND MAKE IT RUN BETTER THAN A CHEVROLET FOR INSTANCE, YOU WOULD REALLY BE SHOWING SOMETHING. YOU'RE REALLY SHOWING PEOPLE THAT YOU HAVE A LOT MORE TALENT TO BE ABLE TO TAKE SOMETHING THAT NORMALLY ISN'T KNOWN AS BEING FAST AND BEING FAST WITH IT. (PAT)>> WELL YOU BROUGHT A LOT OF GOOD LOOKING PARTS. TELL ME A LITTLE BIT ABOUT THIS COMBINATION. 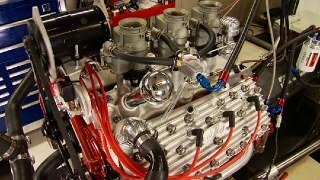 (ROB)>> OKAY THIS IS A REALLY POPULAR WAY TO MAKE 470 CUBIC INCHES OUT OF A BIG BLOCK BUICK WITHOUT SPENDING A LOT OF MONEY OR GETTING ANYTHING EXOTIC. OUR LOGO ON, AND A DEEP SUMP OIL PAN WITH PICK UP FOR THIS APPLICATION. TA PERFORMANCE SUPPLIED THIS ROLLER LIFTER CAM SHAFT ALONG WITH THEIR LIFTERS TO COMPLIMENT THESE EDELBROCK ALUMINUM HEADS WHICH WERE CNC PORTED TO OUR SPECIFICATIONS. WE'RE ALSO USING ARP BOLTS TO SECURE EVERYTHING. PASSAGE IS HALF INCH IN DIAMETER. LATER BLOCKS ARE NINESIXTEENTHS. SO GO AHEAD AND OPEN IT UP TO THE NINESIXTEENTHS SIZE FOR MORE OIL FLOW THROUGH THE SYSTEM. THAT IS GREAT TECH ON OIL MODIFICATIONS BUT ROB DIDN'T STOP THERE. ROB TELL ME WHY YOU CHOSE THIS PARTICULAR BLOCK? (ROB)>> THIS BLOCK HAD AN EXCELLENT LIFTER BORE ALONG WITH A GOOD SONIC CHECK AROUND EACH CYLINDER. THEN WE WENT TO THE EXTENT TO FILL THE COOLANT PASSAGES WITH A HARD BLOCK. THAT IS A CONCRETE LIKE SUBSTANCE THAT WILL INCREASE THE RIGIDITY OF THE BLOCK ALONG WITH THE CYLINDER SEAL. THIS BLOCK WILL HANDLE ANYTHING WE'RE GONNA THROW AT IT TODAY. (PAT)>> WELL WITH ALL THAT SAID AND DONE, THIS BLOCK IS READY TO ASSEMBLE AND WE'LL GET TO THAT AFTER THE BREAK. GO, IT'S TIME TO PUT THE BEARINGS BACK IN. THESE MAINS ARE FROM CLEVITE. TO PROTECT THEM DURING START UP ROYAL PURPLE MAX TOUGH ASSEMBLY LUBE WILL SLICK THEM UP. IT'S A UNIQUE SYNTHETIC FORMULA THAT ADHERES TO METAL SURFACES TO CREATE A LOAD BEARING PHYSICAL BARRIER BETWEEN SURFACES. 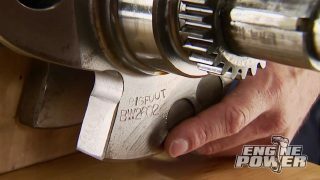 THIS CRANK SHAFT UNDERWENT SOME SERIOUS SURGERY TO WORK IN THIS BUICK BUILD. 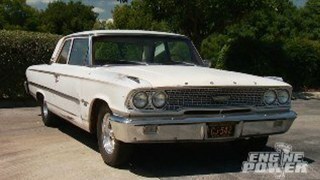 FIRST OFF IT WAS OFFSET GROUND FROM THREE-900 TO THREE-950 STROKE, AND SIZED TO ACCEPT A BIG BLOCK CHEVY ROD JOURNAL AT TWO-200. IT'S BEEN CONVERTED TO AN INTERNALLY BALANCED CRANK, AND THAT'S WHY THERE'S SO MUCH HEAVY METAL THAT'S BEEN INSTALLED IN THE COUNTER WEIGHT. THIS IS ALL MACHINE SHOP WORK AND IT WAS PERFORMED AT FINISH LINE MOTORSPORTS IN FREEPORT, MICHIGAN. NOW IT'S TIME FOR 65 POUNDS OF BUICK IRON TO GET LAID IN THE MAIN SADDLES. DEGREES AND THE EXHAUST AT 262 DEGREES AT 50 THOUSANDTHS LIFT. 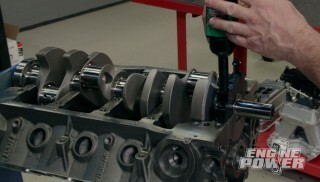 THE LOBE SEPARATION ANGLE IS 113 DEGREES, AND IT HAS 600 THOUSANDTHS GROSS VALVE LIFT ON BOTH THE INTAKE AND EXHAUST WITH A ONE POINT SIX ROCKER ARM. THE INTERESTING THING ABOUT THIS CAM IS IT HAS A FOURSEVEN FIRING ORDER SWAP. 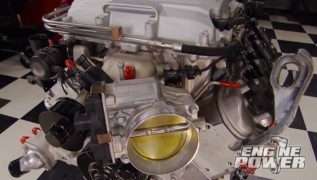 WHAT THE FOURSEVEN SWAP DOES IS REDUCE MAIN BEARING LOADING ON THE CRANK SHAFT BUT ALSO CHANGES THE PULSES IN THE INTAKE MANIFOLD TO HELP EVEN OUT FUEL DISTRIBUTION IN OPEN PLENUM INTAKES. A FEW THINGS NEED TO HAPPEN SO WE CAN DEGREE THE CAM SHAFT. FIRST THE TIMING SET IS INSTALLED STRAIGHT UP. IT MAY NEED TO BE ADVANCED OR RETARDED, AND WE'LL KNOW THAT IN A COUPLE OF MINUTES. THESE CUSTOM DIAMOND PISTONS ARE SWEET TO SAY THE LEAST. THEY'RE MADE OUT OF 26-18 ALUMINUM ALLOY AND ARE A FLAT TOP DESIGN WITH DUAL VALVE RELIEFS. THEY HAVE A ONESEVEN-75 COMPRESSION HEIGHT AND ONLY WEIGH IN AT 615 GRAMS. THEY HAVE A 16TH, 16TH, THREESIXTEENTHS RING PACK, AND THE WRIST PIN IS NINE-90 AND IT'S HELD IN WITH DOUBLE SPIRAL LOCKS. THEY MATE UP TO EAGLE HBEAM RODS WITH A SIX-800 CENTER TO CENTER LENGTH. THIS IS THE SAME ROD THAT'S USED IN A BIG INCH BIG BLOCK CHEVY. WITH NO RINGS ON THE PISTON AND THE ROD BEARING IN PLACE, WE CAN SLIDE IT IN THE BORE AND ATTACH IT TO THE CRANK FOR THE NEXT STEP, WHICH IS DEGREEING THE CAM. IT CAME IN AT 111.25 DEGREES, 113 WAS THE TARGET. 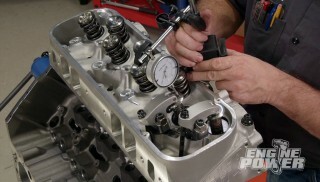 OUR TIMING SET HAS THREE POSITIONS FOR ADJUSTING THE CAM, STRAIGHT UP, FOUR DEGREES ADVANCED, OR FOUR DEGREES RETARDED. ON THE STRAIGHT UP PART OUR CAM CAME IN AT ONE AND THREE QUARTER DEGREES ADVANCED. SO WE'LL LEAVE IT RIGHT THERE. THE NEXT THING TO BE DONE IS LUBING THE ROD BEARINGS WITH THE SAME ROYAL PURPLE MAX TOUGH WE USED ON THE MAINS AND LUBING THE SKIRTS AND RINGS WITH OIL TO INSTALL THE PISTON AND ROD ASSEMBLIES. A TOTAL SEAL TAPERED RING COMPRESSOR WILL AID IN GETTING THEM IN THE BORES. WE DO THIS CAREFULLY, MAKING SURE THE RINGS DO NOT CATCH ON THE DECK. THIS COULD DAMAGE A RING. IF ANY RESISTANCE IS FELT, STOP AND FIGURE OUT WHY. TO KEEP THE CAM FROM WALKING FORWARD A ROLLER CAM BUTTON MUST BE USED. 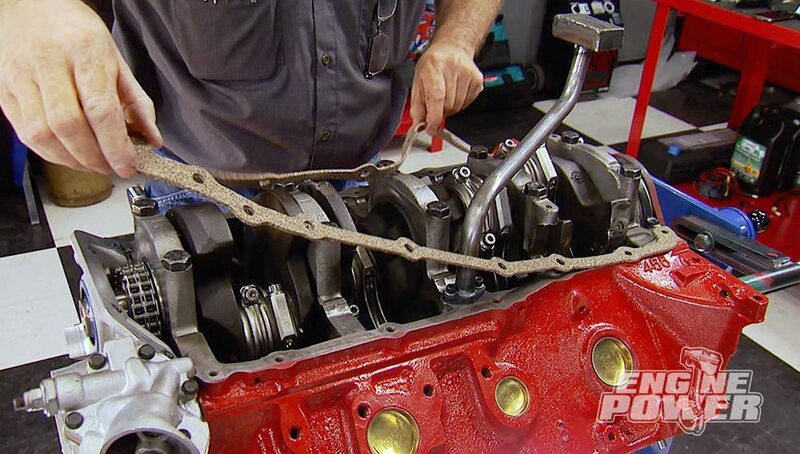 A COMETIC GASKET WILL SEAL THE TA PERFORMANCE TIMING COVER THAT ROB TOLD YOU ABOUT EARLIER TO THE BLOCK. IT'S CONSTRUCTED OF ALUMINUM AND ALSO HOUSES THE OIL PUMP. ON THE BOTTOM THE OIL PICK UP TUBE CAN BE BOLTED ON. THIS DEEP SUMP OIL PAN IS ALSO FROM TA PERFORMANCE. IT HAS A NINE QUARTER CAPACITY, AND DUE TO ITS RIGID DESIGN SOME ADDITIONAL STEPS ARE NEEDED TO ENSURE A GOOD SEAL. A SMALL BEAD OF SILICONE IS NEEDED ON THE TOP OF THE REAR CAP SEAL, AS WELL AS BOTH SIDES OF THE TIMING COVER WHERE IT MEETS THE PAN RAIL. NOW PLACE SILICONE IN THE FOUR TIMING COVER BOLT HOLES. WE SPRAYED THE PAN RAIL GASKETS WITH THREEM SUPER 77 ON THE BLOCK SIDE TO KEEP THEM IN PLACE AND TO PROMOTE A GOOD SEAL. THESE ARE COMETICS AND ARE LAID IN PLACE NOW. 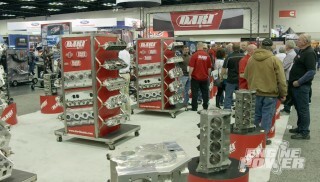 FINALLY THE PAN IS POSITIONED AND TIGHTENED DOWN WITH THE BEST AUTOMOTIVE FASTENERS IN THE INDUSTRY, ARP'S. 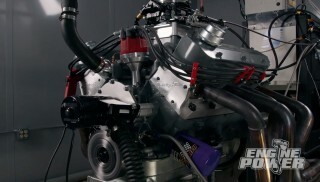 THE MODIFIED HEADS ARE NEXT, ALONG WITH ROB'S ENHANCED INTAKE, FOLLOWED BY THE DYNO, STAY WITH US. (PAT)>> WE'RE BACK BUT WE STILL HAVE A WAYS TO GO. I'M GETTING THE DECKS PREPPED SO WE CAN PUT THE HEAD GASKETS ON, BUT BEFORE THAT ROB'S GONNA TELL YOU A LITTLE BIT ABOUT WHAT HE'S DONE TO THE HEADS. 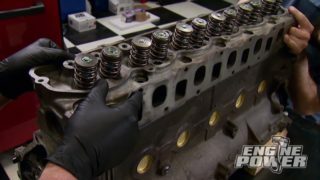 (ROB)>> I STARTED WITH THESE 455 ALUMINUM CYLINDER HEADS BY EDELBROCK. WE OPENED UP THE CHAMBERS TO 70cc. THEN WE CNC PORTED THE INTAKE PORTS. THEY FLOW 325 CFM AND 225 CFM ON THE EXHAUST. WE CALCULATED THE COMPRESSION RATIO AT 11.33 TO ONE. WE COULD GO A LOT HIGHER BUT SINCE IT'S A PUMP GAS ENGINE WE'RE GONNA LEAVE IT AT THAT. (PAT)>> COMETIC SUPPLIED THESE MLS HEAD GASKETS TO SEAL THE HEADS TO THE BLOCK. DOWN GET THE SEALING JOB DONE. NOW THE HEADS CAN GO ON AND GET POSITIONED ON THE DOWELS. HALF INCH DIAMETER ARP HEAD BOLTS CAN GET PREPPED WITH ULTRA TORQUE LUBE, AND THEY ARE TORQUED IN THREE STEPS TO 100 POUND FEET. THE TA PERFORMANCE LIFTERS ARE SOLID ROLLERS TO MATCH THE CAM SHAFT. THEY ARE A TIE BAR STYLE AND GET LUBED WITH ENGINE OIL SO THEY CAN DROP INTO PLACE. WHEN IT COMES TO PUSH RODS, THERE ARE SEVERAL COMPANIES IN THE AFTERMARKET YOU CAN CHOOSE FROM. NOW WE HAVE BEEN SUPER PLEASED WITH THE ONES WE GET FROM TRENT PERFORMANCE FOR OUR BUILDS. THEY MADE THESE FOR US ON SHORT NOTICE. THEY HAVE A 135 THOUSANDTHS THICK WALL AND ARE 10-ZERO-50 IN LENGTH. AS ALWAYS, GOODSON'S EXTREME PRESSURE LUBE IS ON THE BALL ENDS. SCORPION ONE POINT SIX RATIO ROLLER ROCKERS WILL REST ON SEVENSIXTEENTHS STUDS. COLD LASH SETTING IS 16 THOUSANDTHS ON THE INTAKE AND 18 THOUSANDTHS ON THE EXHAUST. THE INTAKE MANIFOLD IS A SINGLE PLANE DESIGN FROM STAGE ONE. IT'S MADE FOR A DOMINATOR CARBURETOR AND THE RUNNERS HAVE BEEN PORT MATCHED TO THE CYLINDER HEADS. THIS BRINGS US TO THE END OF THE ASSEMBLY ON THE ENGINE STAND. 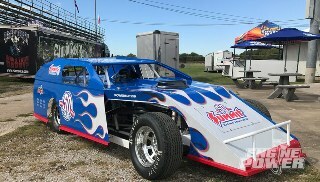 WE TRANSFERRED IT TO THE DYNO CART AND FINISH THINGS UP IN THE DYNO ROOM. (PAT)>> YOU KNOW WHAT'S NEXT, DON'T MISS IT. (PAT)>> WE'RE BACK WITH ROB'S BEEFY BIG BLOCK BUICK. WITH THE TIMING SET AT 28 DEGREES, LET'S SEE WHAT SHE'S GOT. (MIKE)>> ALRIGHT GENTS, FIRST PULL, GONNA DO 25 TO 45, ABOUT 500 RPM PER SECOND SWEEP, 93 OCTANE PUMP GAS, LET'S SEE WHAT IT'S GOT. WITH THE SMOOTH LOAD UP ON THE DYNO BRAKE AND THE CLEAN SWEEP. THERE YOU GO, 478 HORSEPOWER, 559 POUND FEET OF TORQUE. IT'S ON 28 DEGREES OF TIMING. (PAT)>> YEAH SHORT ON TIMING. THIS IS A SEE WHAT IT DOES PULL. THAT WAS ACTUALLY REALLY ENCOURAGING. (MIKE)>> NICE FLAT CURVE, NO BAD SPOTS IN IT. SO START TUNING AWAY BOYS. (PAT)>> WE AREN'T GONNA CHANGE THE TIMING RIGHT NOW BECAUSE WE NOTICED ON THE INITIAL RUN THE CARB WAS A LITTLE ON THE LEAN SIDE. THAT MEANS SOME VERY GOOD THINGS. THAT MEANS IT'S GONNA MAKE SOME POWER CAUSE IT WANTS MORE FUEL ALREADY AT THAT SIZE JET. SO WE INCREASED THE CARB FOUR JET SIZES ALL THE WAY AROUND, ENDING UP WITH 88'S IN THE FRONT AND 98'S IN THE REAR. WE'RE TAKING THIS RUN FROM 3,500 TO 5,500 RPM. (MIKE)>> THERE WE GO. STEPPED IT UP, 568 HORSEPOWER, 559 POUND FEET OF TORQUE, STILL A GOOD, SOLID GRAPH. 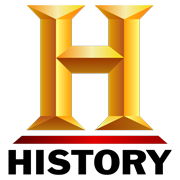 (MIKE)>> LET'S SEE WHAT AIR/FUELS DID, IN THE MONEY! (PAT)>> GOOD, NOW WE CAN ADD SOME TIMING TO IT. BRINGING IT UP TO 30, AND WE'LL INCREASE THE RPM RANGE FROM 4,000 TO 6,000 RPM. IT'S GONNA BE GOOD, YEP. (MIKE)>> THERE WE GO, NOW WE'RE TALKING. TWO DEGREES STEPPED IT UP TO 606 HORSEPOWER AND 567 POUND FEET. (ROB)>> EXCELLENT, EXACTLY WHAT WE SHOULD HAVE. (PAT)>> WHERE DID IT MAKE PEAK TORQUE? (PAT)>> AND MADE PEAK POWER? (MIKE)>> PEAK POWER AT 6,000 AND STILL CLIMBING. (PAT)>> OKAY, STILL CLIMBING, ALRIGHT. (PAT)>> LOOK AT THAT, 612, 568 POUND FEET OF TORQUE. 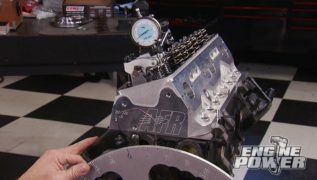 (MIKE)>> NOT BAD OUT OF 470 INCHES ON PUMP GAS. (PAT)>> THIS IS AN EXCELLENT PUMP GAS ENGINE. 470 INCHES, IT'S MAKING EXCELLENT POWER. NOW INTERESTINGLY ENOUGH, LIKE WE TOLD YOU ABOUT THE, SEE HOW THE TORQUE LEVELED OFF RIGHT THERE? TWO DEGREES OF TIMING IN IT AND IT STAYED THE SAME. (MIKE)>> SO ONE LAST TUNING TRICK, ADDING A TWO INCH PLENUM SPACER. (ROB)>> I THINK WE CAN PROBABLY LEVEL IT OFF AROUND 620-ISH, 625. I'M HOPING FOR A LITTLE MORE BUT WE'LL SEE HOW IT GOES. 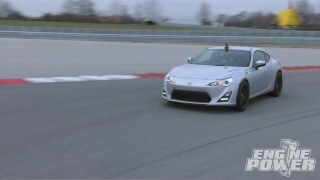 (MIKE)>> AND THE ENGINE AGREED, 628 HORSEPOWER. (PAT)>> THAT'S A BUICK RIGHT THERE. (ROB)>> THAT'LL SCARE A FEW PEOPLE. EVERYBODY HAD A CHEVY AND I TOOK MY BUICK AND I BEAT EVERYBODY'S CHEVY AND THEY COULD NOT BELIEVE IT. EVERYBODY WOULD SHAKE THEIR HEADS LIKE, WHAT DID YOU DO TO YOUR CAR TO MAKE IT SO FAST, AND THAT'S HOW I STARTED MY BUSINESS BECAUSE I TOLD THEM IF I CAN MAKE A BUICK RUN I CAN MAKE YOURS RUN. DIAL IN YOUR CAM TIMING IN TWO DEGREE INCREMENTS, EIGHT DEGREES ADVANCED OR RETARDED. IT'S A BIT MORE COSTLY BUT IT'S WELL WORTH IT TO HAVE THAT KIND OF FLEXIBILITY. JUST WHEN YOU THINK IT CAN'T GET ANY BETTER THERE IS THE HEX ADJUST TIMING SET. IT INCORPORATES ALL THE FEATURES OF EVERYTHING WE'VE SHOWN YOU BUT HAS THE ADDITIONAL BENEFIT OF BEING ABLE TO ADJUST THE CAM TIMING ON THE TOP GEAR USING THIS ECCENTRIC. IT ALLOWS YOU TO PERFECTLY ADJUST THE CAM POSITION EXACTLY WHERE YOU WANT IT. THIS IS IMPORTANT FOR RACE ENGINES WITH BIG LIFT AND DURATION CAMS PLUS TIGHT PISTON TO VALVE CLEARANCES. NEXT ON THE LIST IS THE INFAMOUS GEAR DRIVE. NO CHAIN HERE, JUST BILLET GEARS WITH AN IDLER GEAR SET IN BETWEEN THEM THAT KEEPS THE VALVE TRAIN IN SYNC. THEY ARE VERY ACCURATE AND HAVE THE DISTINCT WHINING SOUND WHEN RUNNING THAT EVERY GEAR HEAD WILL RECOGNIZE. THE FINAL ONE WE'LL SHOW YOU IS A BELT DRIVE. THIS ONE IS FROM JESEL AND IT'S DESIGNED TO WORK WITH HIGH RPM AND HIGH POWER LEVELS UTILIZING A ROUND TOOTH BELT, A PURPOSE BUILT FRONT COVER, AND AN ADJUSTABLE CAM GEAR THAT ALLOWS THE CAM TO BE DIALED IN EASILY WITHOUT HAVING TO REMOVE A COVER LIKE A CONVENTIONAL SETUP. IT IS THE MOST EXPENSIVE OF THE BUNCH AND IS USUALLY RESERVED FOR RACING ONLY, BUT IT HAS THE UTMOST IN ACCURACY, DURABILITY, AND SERVICEABILITY, LIKE CHANGING CAMS WITHOUT DROPPING THE OIL PAN AND REMOVING A FRONT TIMING COVER. GOOD TIMES EH! SPECTRE PERFORMANCE JUST CAME OUT WITH A NEW LINE OF INJECTION MOLDED ABS COVERS FOR THE UNDER HOOD OF YOU PRIZED 2010 TO 2015 FIFTH GEN CAMARO. EVERYTHING FROM YOUR FUSE BOX TO YOUR POWER STEERING RESERVOIR. CHOOSE THE STYLE AND COLORS YOU WANT WHEN YOU GO TO SPECTRE PERFORMANCE DOT COM. STAGE ONE AUTOMOTIVE HAS MOVED INTO A BIGGER SHOP BUT THE WAY ROB IS ROLLING, MORE EXPANSION MAY BE NEEDED. WE'LL SEE YOU NEXT TIME.